Whenever a political turn or event happens who do our reporters run to most? 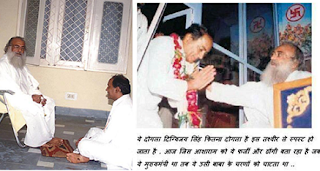 You guessed it – Digvijaya Singh. And what does he offer them? Nothing but filthy utterances against others and mindless statements that aren’t even fact-checked. His own party is on record stating that his statements are not “authorised”. Yet, DS with no political position or responsibility and clearly over-the-hill, is the Guru for most TV editors. The reporters seek his comments like Stenographers and faithfully relay it. By evening, on many occasions, based on his silly utterances, you will find DS doing a full-fledged interview with Barkha Dutt, Rajdeep Sardesai or Rahul Kanwal. It’s a well-planned and organised routine. And then channels like NDTV carry interviews without bothering to fact-check Diggy’s statements. I did recommend a lie-detector for the channel but mounting losses may delay their purchase of one. The danger of being a sycophant is that in the end the bigger sycophants win. Digvijaya Singh for long has behaved like he was the mouth piece of Rahul Gandhi. But he was overlooked and someone else was made the campaign chief of MP and possibly a CM candidate. It’s a monumental tragedy for DS and I had observed that he had suddenly become subdued since September 3. Yes indeed, Jyotiraditya Scindia who is a close confidant, friend and also RahulG’s bench-mate in Parliament took over the Congress campaign in MP. Political parties are usually slow to realise what the people already see. DS was doing bigger damage to the Congress than to any Opposition party. And it took a gossip column to report the reason for his sulking. It’s not just the Congress; DS has caused enough damage to investigations in various terror cases by endorsing “26/11 is an RSS conspiracy” or implying “Batla house” encounter was fake. His routine jibes at Hindus through comments of “RSS bomb-making” factories and Saffron terror have made him a villain for many people. 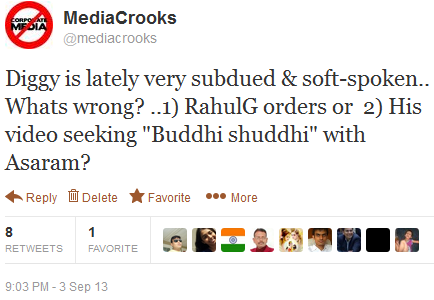 Not to forget frequently calling Yoga guru Baba Ramdev a “thug”. For the arrogance and shamelessness with which he spun silly conspiracies I had called him “India’s most communal politician”. Not just other political party members, the shameless DS had the audacity to call a female party colleague “100% Tunch Maal” and pass it off as a tribute to her. So what finally brought about this sorry state of DS? It’s not very hard to tell. But first in another edition of his hypocrisy he was blaming the BJP for Asaram not being arrested for a while. These pics show who was at the feet of Asaram for a long period. Pics apart there is an instance where DS spoke at an Asaram function and said he looked to the Guru to improve his “Buddhi and Atma” (Youtube). Unfortunately, neither his buddhi nor his atma seems to have ever improved. An even more terrible news was that as CM of MP Diggy had given away a good chunk of land to Asaram Ashram for a mere lease of Re.1/- That is one example of his bogus governance. I have written before that in his 10 years of mis-governance in MP the man couldn’t even build a decent road between the two major cities of MP, Bhopal and Indore. And the distance is just about 170kms or so. In his typical arrogance DS said during the 2003 MP elections that election victories are “managed”. Though I do not have a link to that statement I clearly remember it. The MP campaign committee and Scindia seem to have told DS “don’t darken our door again”. Sometime back Diggy was all tears and sympathy for LK Advani over BJP’s appointment of Narendra Modi as its 2014 Campaign head. LKA was sulking and didn’t attend the party’s Goa meet in June 2013. DS was prompt to tell the world how BJP treated its tall leader shabbily. I wonder whose shoulder he’s going to cry on now that some doors are closed for him and he has been kept out. I guarantee Scindia has the full support of RahulG and there are no more shoulders for DS. It’s the beginning of unhappy endings. But there’s another important reason that may have finally sealed the fate of DS. The Congress was busy passing a string of bills and policies in the run up to general elections. One of the most important decisions they made was that on Telengana and the bifurcation of Andhra Pradesh into two or three states. As party in-charge of AP, much of the closing negotiations on the issue with various sides were being handled by DS. The Congress should have been soaking in glory for the Telengana decision but the reality is far from it. Their Telengana decision has caused more damage than they estimated. AP is on the boil ever since that decision and even many Congressmen don’t support the decision. For once the Congress had banked on DS to come out with a right outcome. He failed. All the parties in the division of Andhra, Telengana and Hyderabad are unhappy with the proposed split. For all we know this decision may never come to be implement. This is the failure that may have finally dumped DS into the political ever-after. The unfortunate truth is Diggy has been practically useless to the Congress since his defeat in 2003. Apart from making silly statements in the media which the party had to mostly “distance” itself from he has proved himself a spiteful and foul-mouthed politician. What happened yesterday is nothing short of extreme humiliation by his own party. This is an unhappy ending DS may not have ever dreamed of. But the political end of this man shouldn’t make anyone unhappy, least of all Congress. We have to see who the likes of Pallavi Ghosh, Barkha Dutt, Sunetra Chaudhary & their motley crew will now run to for their cheap sound-bites. How do you prepare such elaborate, fact filled and conclusive article within a few hours ? I don't BS (oh, DS) has any comment left to comment on this turn of events. 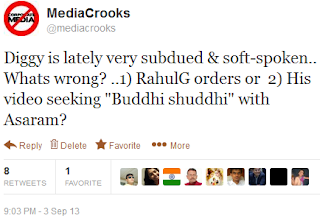 Even the crony media, which was enjoying his (Diggy's) patronage, is sulking in despair. DO I feel sorry for this crook. No, never. He is worse than some deadliest criminals, and no body should have any sympathy for a terror sympathizer. Those who benefitted from this Tenali Rama of KhanChris durbar, over the last decade, must never disown him in his hour of crisis. They must devote atleast a small space in their publications for his political obituary.Osamji must be seething from his watery grave.As for the Andhra fiasco one must sympathise with him. The anti Telagana lobby was never so vocal until the decision was finally made by the KhanChris.For more than 9 yrs no dissenting voice ever came out of AP. So Diggy was led to believe that he was doing them a favour and rejoiced in the division of the state.Apparently there must have been an RSS conspiracy in this sudden U turn by Andhrites. Please don't compare Diggy with Tenali Ramakrishna, because , we telugus have great regard for Tenali Ramakrishna , who was one of the ashtadiggajas of Krishnadevarayas court.He was a scholar and written wonderful kavyas like Ghatikachalam and Panduranga Mahatyam. Google before mentioning such great persons. The Muzaffarnagar riots where triggered when a Hindu girl was eve teased by a Muslim boy who was then attacked grievously by 2 of her relatives later. When alerted about this attack, local Muslims killed both the Hindu boys. No wonder it is called "TOI"let! He cant step in coastal andhra forever in his life. If ever he does, he will face a bigger humiliation than what he faced in MP. We Telugu's feel utterly humiliated when people like Diggy, Moily, Antony, Gulam Nabi Azad etc. who cant win elections in their own states take decisions on bifurcating our state. The wrath of Telugu's would haunt the congress party. Its good that he has been shown his real place in Congress Party. I truly believe that despite RG own dumbness, DG has done significant damage to his career as well. A person who has little mind of his own, and being guided/mentored by a 'foul-mouthing' 'venom-spitting' person about his own religion of Hindus is worst thing you can do to impress people of this country. The secular folks may be enjoying his 'abuses' but not the Hindus. Some what disagree with reason. Telangana could never have been a sweet story for congress the whiole script was hopeless. I think his cheap polarizing comments which congress thought would help them in general by propagating ambiguity wrt to minority constituence BUT the man has lost his credibility beyond a point to win then any vote. Ravijee. I was expecting this story, brilliantly told. In nutshell now Rajiv's Latkans are being replaced by Rahul's. World goes by. Tomorrow it will be Scindia's turn. I'm very sad for Diggy, we will miss you Diggy. Most of all, BJP will miss you very badly, you've been a tireless campaigner for BJP with your big foul mouth and silly comments. I seriously doubt you remember all those silly statements you made with Barkha & Rajdeep while giving interviews, rest assured you've been a very good comedian for congress stable. 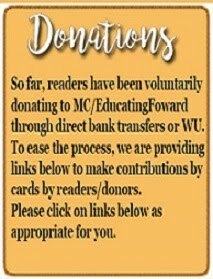 Would you please add "Deserving" word in title of this article? ye to hona hi tha ...bimar kutte ko malik bhi ghar se bahar nikal deta hai ,taki wo apne malik ko hi na kat le..isse bahar na ghoomne diya jay..isse jaldi se jaldi pakad k thailand export kar de..isse india aur thailand dono ki bhook thodi shaant hogi..unko meat mile ga aur bharat ko foreign exchange.. I feel that many have missed the real reason in the timing of Telangana declaration by Congress, It was just before NaMo's meeting. Congress/MSM and Digvijay Singh thought that NaMo will back Teleangaana and will grab the headlines and win AP . In panic Congress declared Telangana is the reality. I really pity such idiotic Congress decision process that they declared such an important decision which they avoided to take for 9 years and took it in panic just to counter one public meeting of NaMo. Is this a policy of governance? This is simply careless and plain anti national behavior of Congress. No wonder Digvijay was in charge of AP for congress and now Congress in AP is "धोबी का कुत्ता न घर का ना घाट का". You are right.Their Telengana declaration was times to spite Modi's rally.That is bad governance and even bad politics.Modi has derived full mileage from this clumsy [ unfortunate for people of AP] episode. His political downfall began with his much publicised visit to Azamgadh.What a way to seek minority votes! It speaks volumes of Congress leadership that it has so long to discover the utter uselessness of this man.Congress should have known this when he lost MP. The BJP would lose their best friend if his career ends this way because with his idiotic comments he has been pushing voters away from the Congress. DS tried to be clever by half in Andhra. Result: reports from many parts of AP about Rajiv and Indira statues being pulled down. Those statues were given the full treatment of shoe garlands, defacement, defilement, damage, knocking off the pedestals, abuse and dragging thru the streets. The MSM put a tight lid on these newsworthy items but SM wasn't so kind. 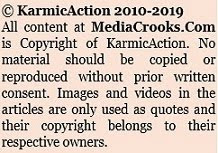 (I guess you can see the pix in Niti Central archives). Marie Antoinette II and the Clown Prince are punishing DS for these acts of lese majeste. The sacred statues of the Holy Family, begad! DS, ol' boy, purgatory has just begun. It ain't ended yet. Whoa... I will look into Niti Central but Do you have any other link. Diggy should be happy that he was only locked out of the hall unlike Sitaram Kesri who was kept locked in a toilet by the CON party to prevent him from attending a meeting. Anyway real Dog days are here for Diggy from now on. I never thought i would say this but has BURQA dutt changed or what ? among all mujaffarnagar debate on news channels during primetime , shockingly i found BURQA dutt most unbiased and grilled congress /sp more than BJP ( while on other channels it was opposite , especially that fat b@tch Navika from times now although she was put to place by Meenakshi lekhi ( Jhansi ki rani of BJP )..coming to BURQA dutt it might be a case of showing different cards and playing some other cards ....and this elderly lady Aarti ( Yeah another EXPERT OF HINDUTVA-BASHING BRIGADE ) passionately bought godhra in present case across all the channels.. i think she is a new torchbearer of SIKULARISM in media...silly ppl who dont undestand a word about real secularism..
Good one! The alternative has already been found in the likes of Manish Tiwari. He has an opinion on everything, similar to Diggi, "Foot in the Mouth" man! give instructions from behind like a puppet show. would change nappies for Rahul baby. In case of Muslim traditions, the brothers are murdered or father imprisoned or also killed to take the Throne, that is their tradition in India. brilliantly written, really diggy is useless to the Congress. Once upon a time, there was this crown prince. His family lorded over a country that they rendered poor over several decades of their rule. There was widespread discontent among denizens over the family's role in ensuring their lives were a misery. Crown prince had a few "smart-but-soul-for-sale" advisors who told him that it was kaput for the dynasty if he did not sell people dreams because people believed dreams sold by a dimpled face, even if it was from a dimpled face extremely low on intellect. Crown prince first wanted to understand what people's aspirations were. He confronted the first commoner he came across and asked him, "What is your dream?". The commoner said, "I dream of everything you have." That set the crown prince thinking and he decided to make a checklist of his own dreams. Holiday in every country of the world. Check. Girlfriends of every nationality in the world. Check. Made enough money to last 100 generations. Check. Own at least a dozen islands, aircraft, yachts. Check. Ensured brother-in-law is well settled with enough money for his 100 generations. Check. Own the best automobiles in the world. Check. Savored all the finest liquor in the world. Check. Memberships of all the finest clubs in the world. Check. Sold them dreams that they will never realize. Triple check. I remember when he was all over Nitin Gadkari when Gadkari was in the news for the Purti Group of his. Nitin sued him in court and DS said he does not care for the courts and or the court orders. Later when the court later issued a warrant he went to say "Now that court has issued he will think of the veracity of his claims on Nitin". CONgress probably thought that Diggy is too old to 'experience' a Happy Ending and giving him a treatment that he deserves. Bloody anti-nationals! Your writing is bang on. I have read this and some of your other write ups. Every time you hit the nail very hard and to the point. Keep up the great work. Yes, Diggy or Should I say Pomerian DOGGY which is only good for Barking, has been finally put to the place where he belongs. outside the door.